Chicago's Grant Park will never be the same. 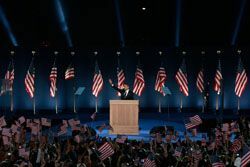 Barack Obama's riveting 2008 victory speech rang through crowds, as MA Lighting's grandMA consoles (supplied by overall Lighting Contractor - Christie Lites) took front row. States lighting designer Bob Peterson: "The Obama campaign provided the statement for the directive, which was to elegantly transfer from the exuberance of the campaign to the seriousness of the presidency. What that meant to me was to deem victory night a serious and strong historical evening." According to Peterson, "We massaged our single look over a course of three nights. The primary component was to light the President-Elect to his very best advantage, then cleanly illuminate the 100,000+ people in the park, all at exposures that would allow the skyline and city to be a backdrop in the network cut shot." Several disciplines of equipment including Martin, SyncroLite, and Musco were specified and the team then spent a lot of time programming, so that the hang and focus of each instrument was carefully layered. "I worked with programmer/director/operator Kevin Lawson to decide which consoles to use," says Peterson. "He chose grandMAs." The MA Lighting grandMA console provides quick-and-ready solutions for applications such as theatres, concert touring, clubs, television, musical events, amusement parks or cruise ships. It can control moving lights, conventional lights, and effects, as well as LEDs and video - even when working in real time with maximum channel count. It provides a truly flexible and comfortable programming and operating environment, and is capable of controlling huge numbers of devices efficiently and virtually effortlessly. For more information about the grandMA console, visit www.actlighting.com.